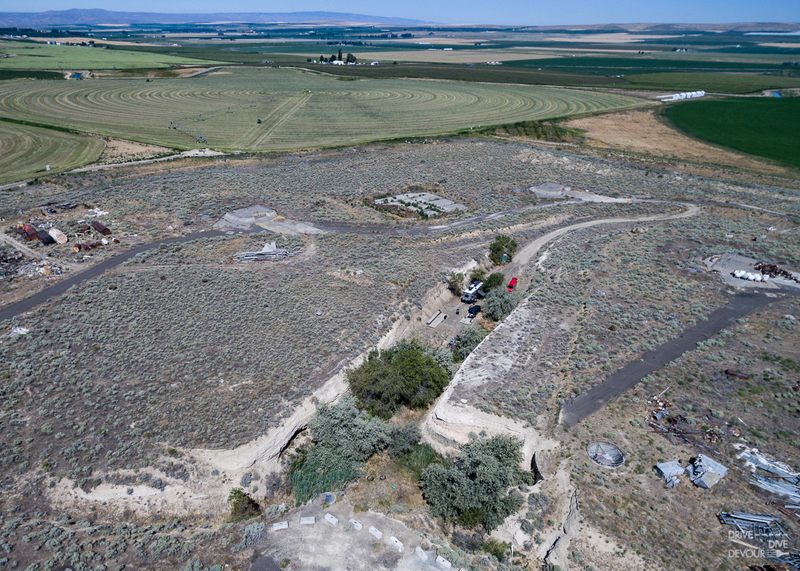 In the middle of Washington state’s farm country, is a unique dive that I learned about when researching the Valhalla missile silo in Texas. 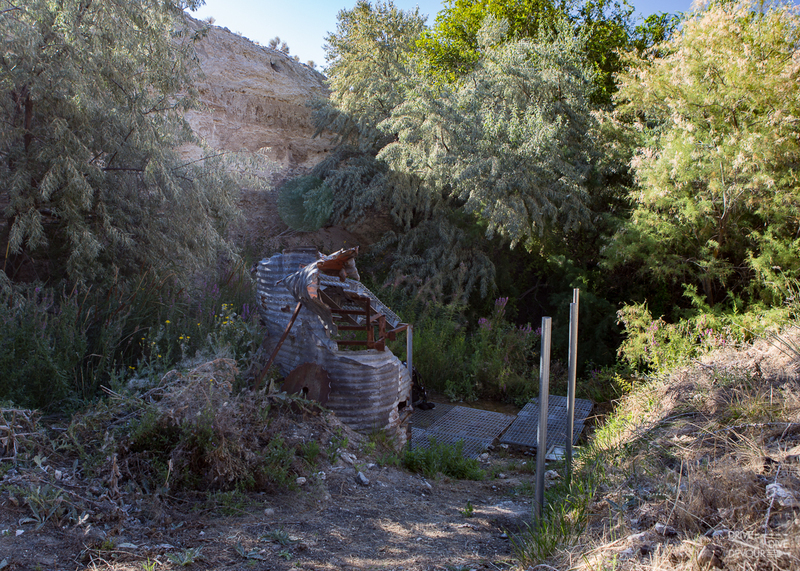 Once I found out about this Titan missile silo dive, I added it to our map and hoped to get to the area eventually. The site is fairly remote from any major cities, but as luck would have it, it ended up being near our route from Portland to Spokane, Washington. This Titan missile silo complex is much larger than the Atlas silo that I dove previously. It also had much more of the original equipment inside. 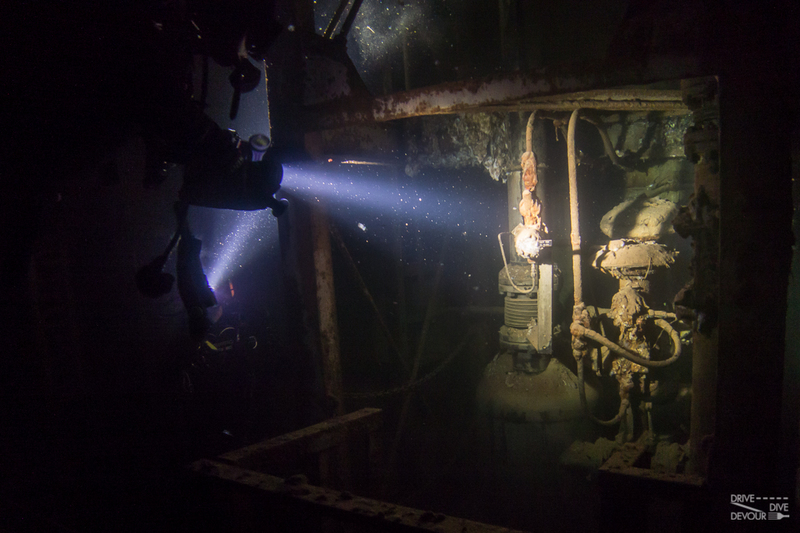 I only did 2 dives here, but I could easily do more to explore other areas in the complex. 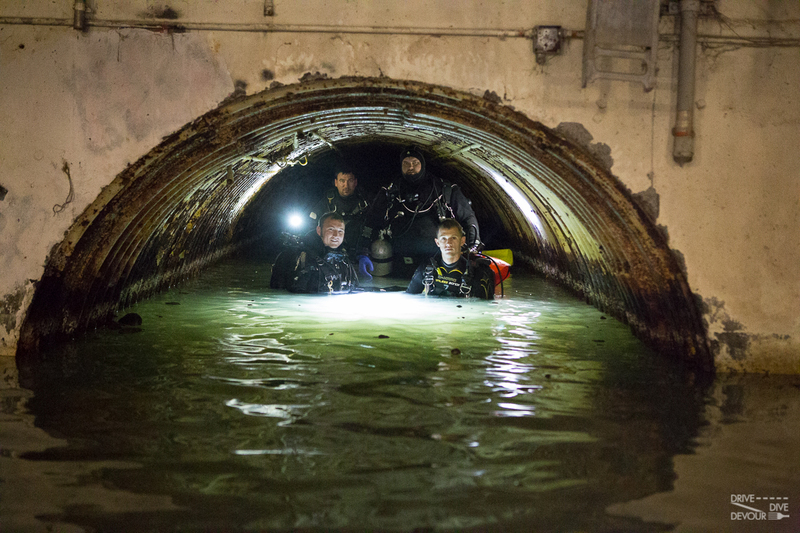 You can even make your way through horizontal tunnels underwater into other parts of the missile complex if you are properly certified and equipped. This is a painting of the missile complex. We entered through the vertical shaft near the center. Traveling by motorhome made this dive a lot more accessible. We spent the night in town before the dive and then drove the motorhome right down to the dive site. 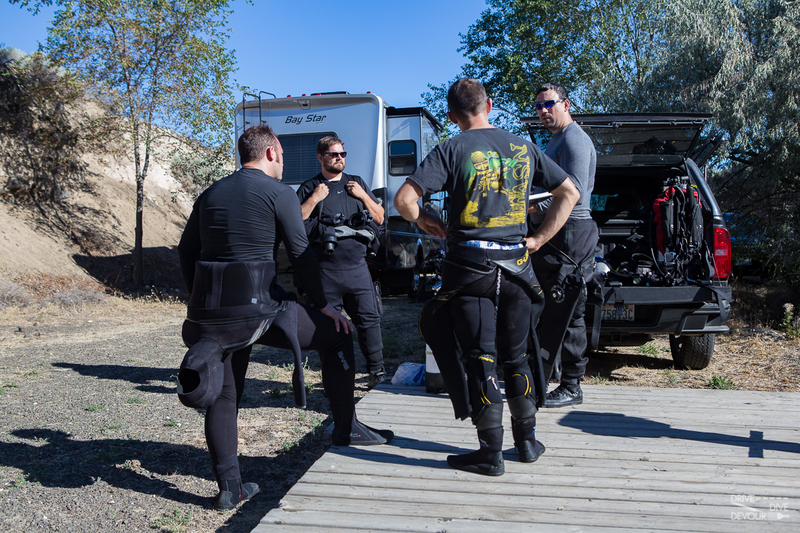 It was nice to have the AC running and the awning out in the 90-100 degree heat while we suited up into our dry suits for the mid 50-degree water below. The dive shop has set up some benches and tables on the surface to make it a bit easier to gear up. Here we are receiving our pre-dive briefing before heading down into the tunnels. 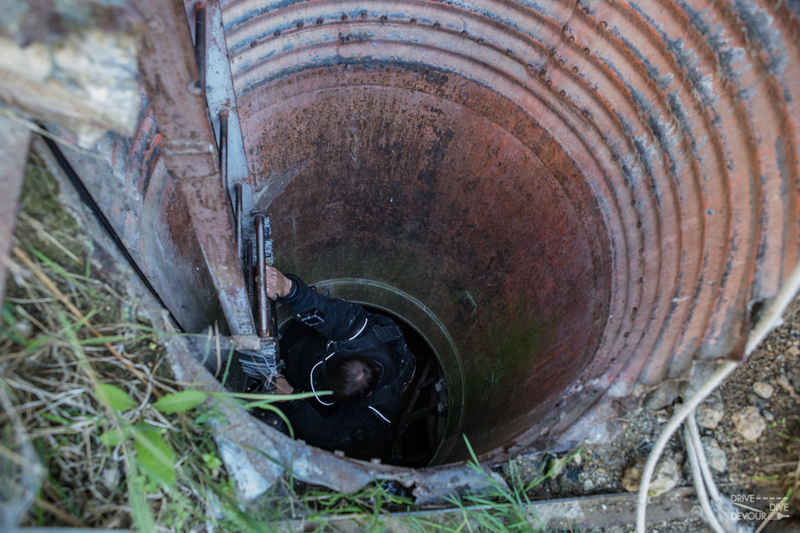 The entry down the old emergency escape hatch. 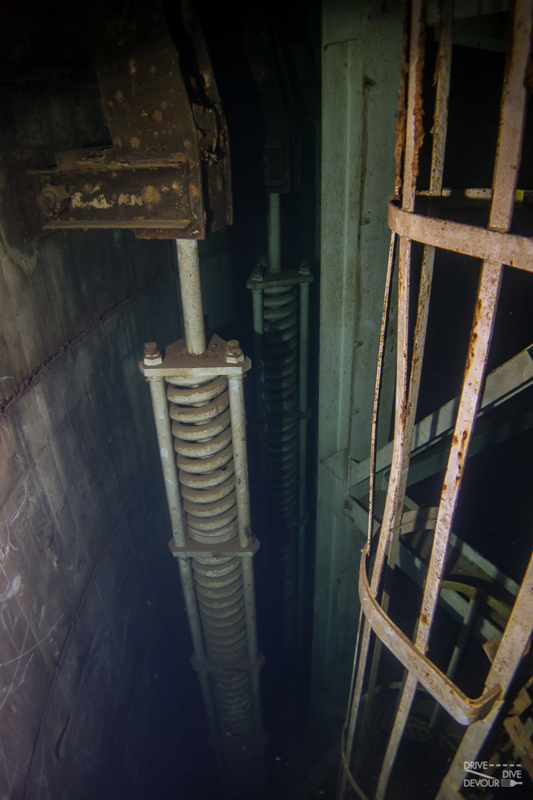 This shaft would have been filled with sand to protect the workers inside from a blast above. If they needed a quick escape, it could be opened and the sand would fall into the room below and then they could climb out. 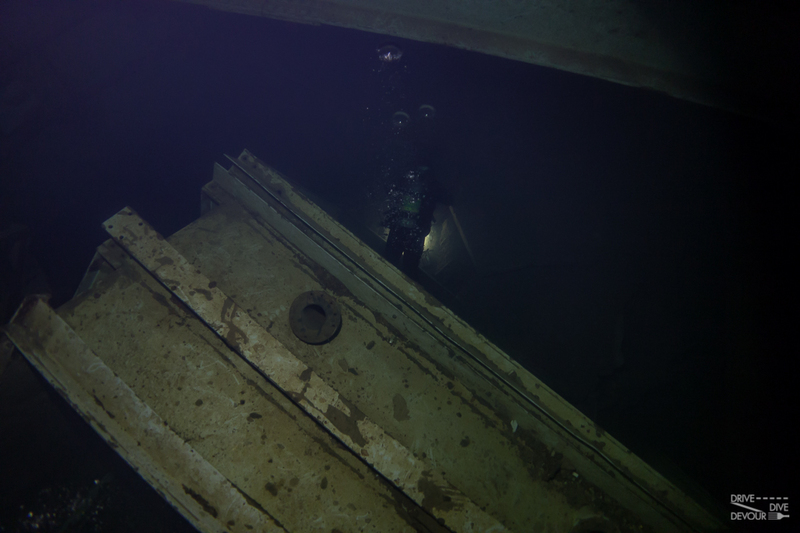 The dive shop rigged up a pulley system so we could easily lower gear down into the staging room below. Here you can see the sand from the escape shaft covering the floor. 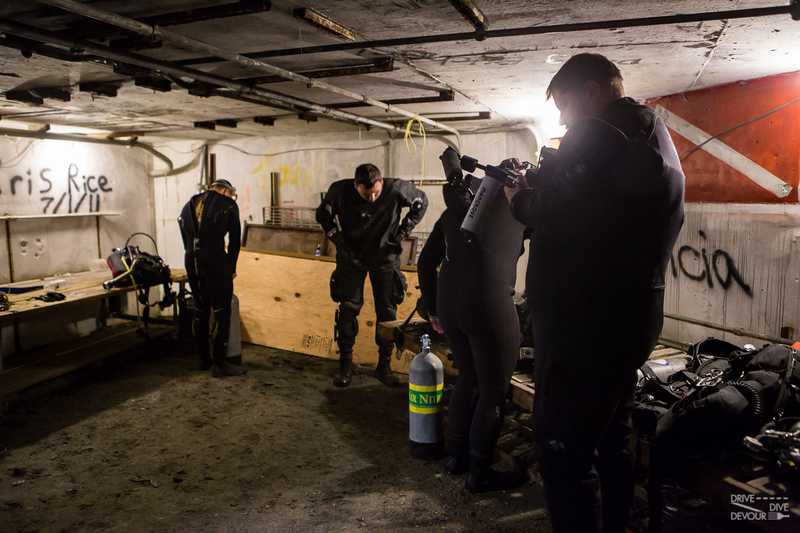 We made our final gear checks and prep in this room before we headed into the tunnels. These are the last lights we will see other than the lights we brought with us. 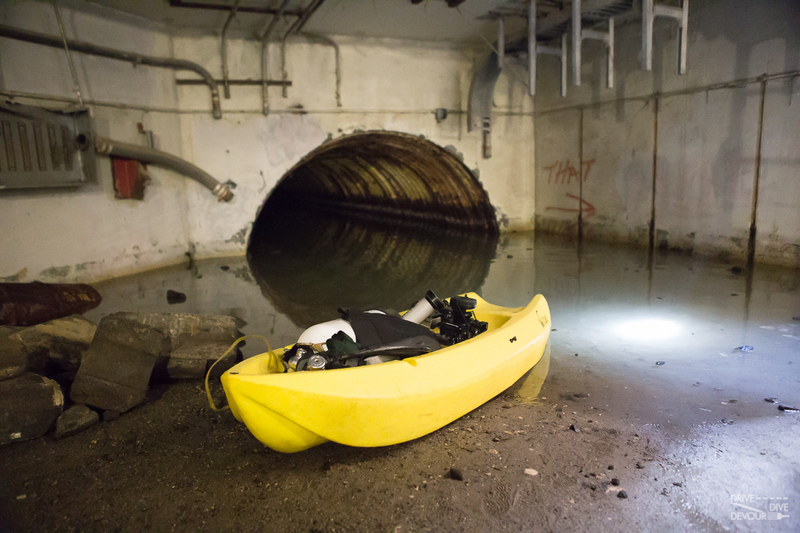 The shop keeps a small kayak in the prep room so we can drag extra gear with us through the flooded tunnels. 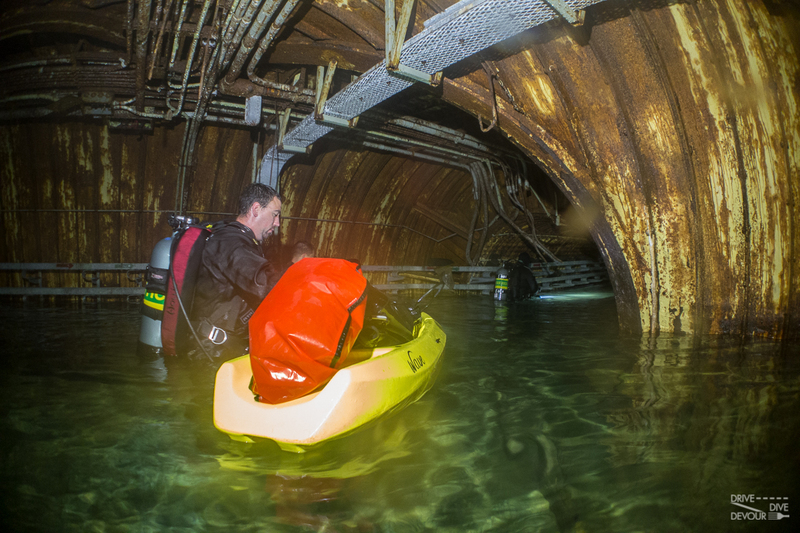 The tunnel behind the kayak is our entry into the silo complex. Our group heading into the silo. 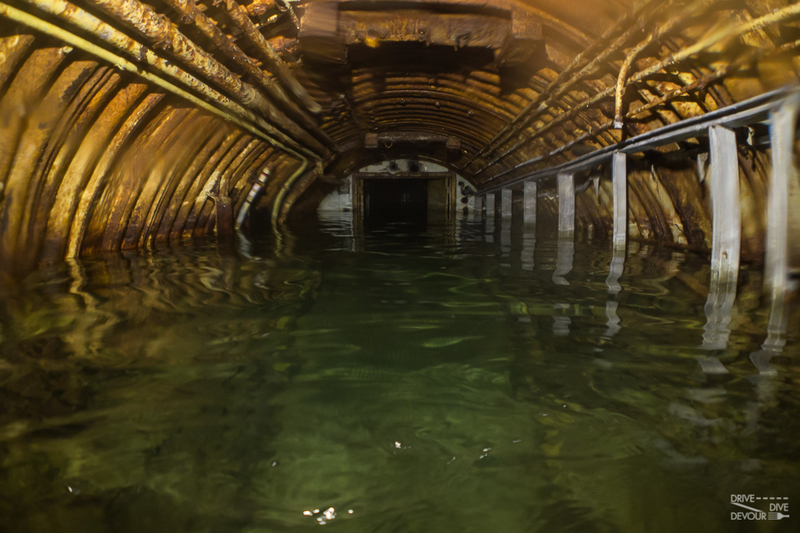 The tunnels connecting the silos are all flooded. The metal flooring was salvaged long ago, so we had to make our way on exposed beams and pipes. We kept our BCs inflated so that when we missed a step we wouldn’t fall into an open hole in the floor. 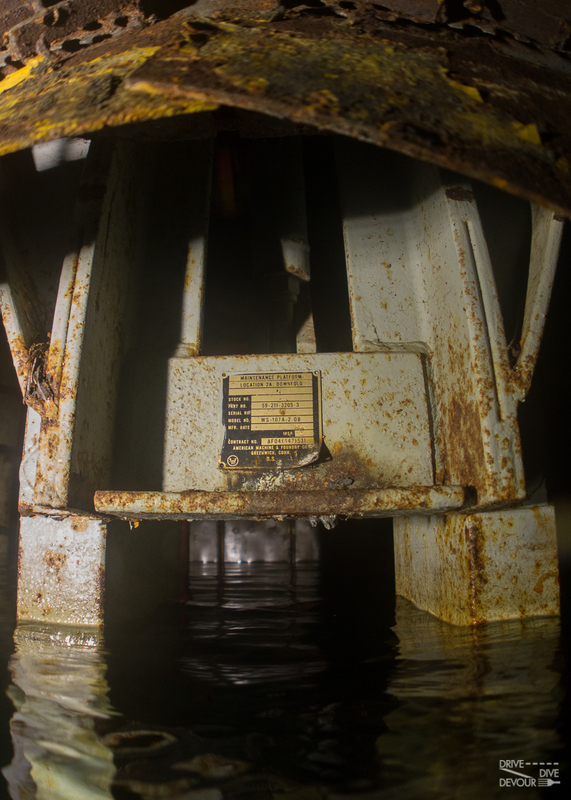 The water became deeper and deeper as we approached the silo. 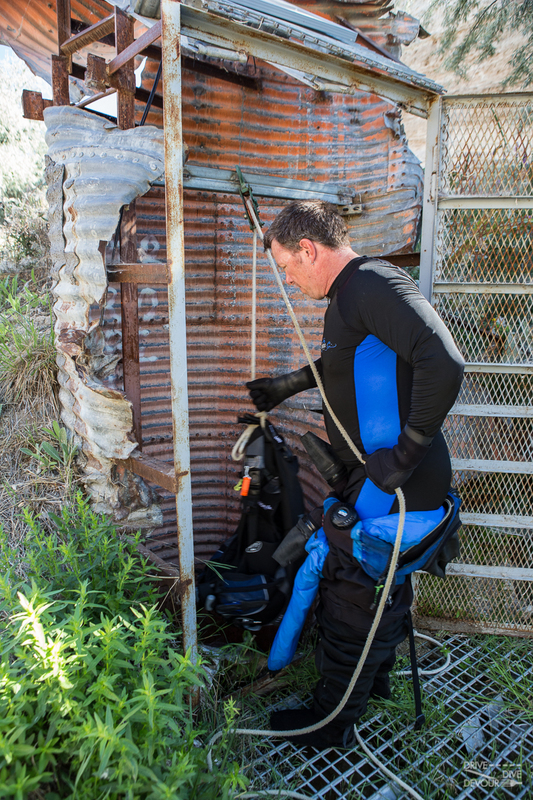 I actually enjoyed this because it helped to keep the weight of the tanks off our backs and the water was nice and cool in our dry suits so we weren’t too hot by the time we reached the silo. 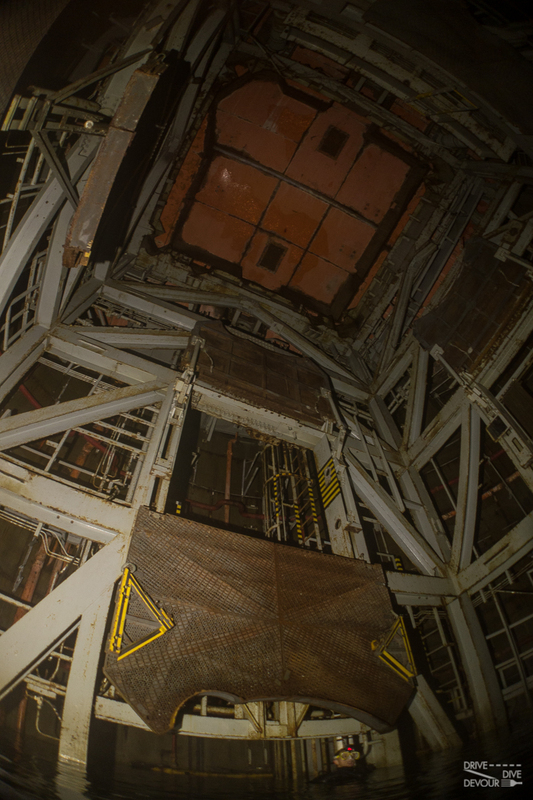 When we reached the silo through the door in the photo above, we put on our fins and masks and deflated our BCs to drop down into the main missile silo. Here is a video I made of our hike in and dive into the silos. 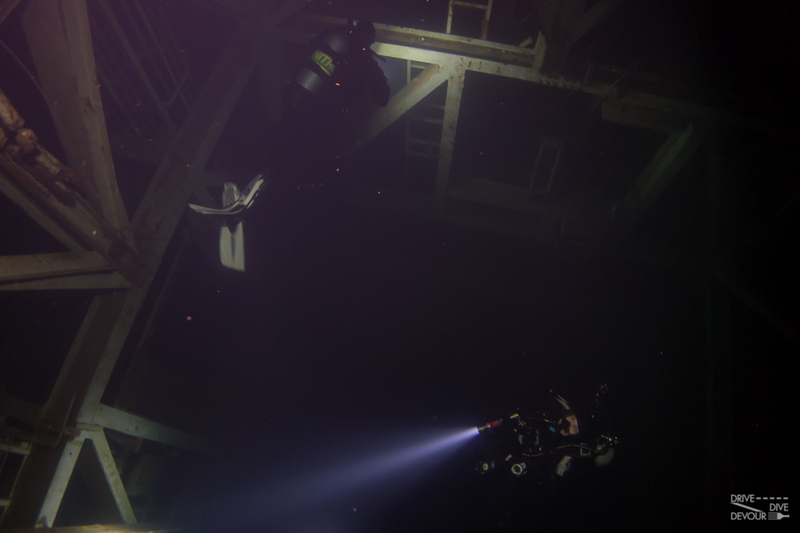 As long as we made sure not to disturb the silt on the beams, the visibility in the silos was pretty great. 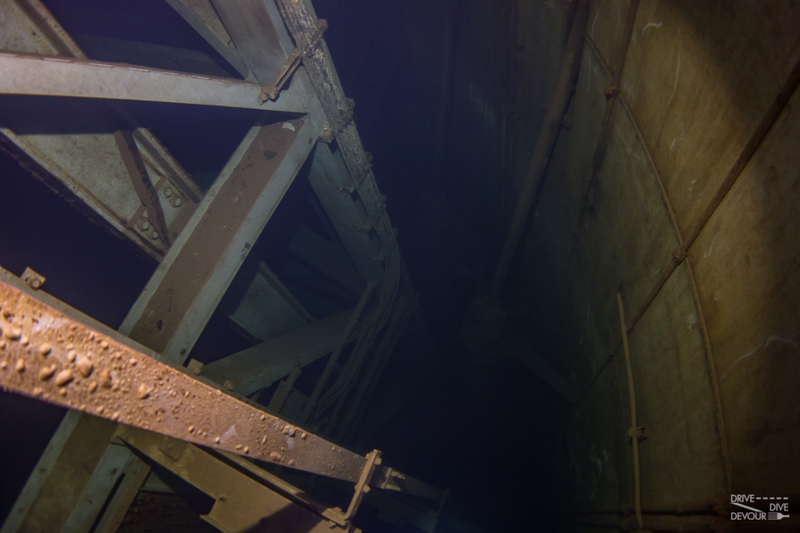 The depth of the silo was around 105-110 ft. The water temperature was a pretty consistent 55 degrees. 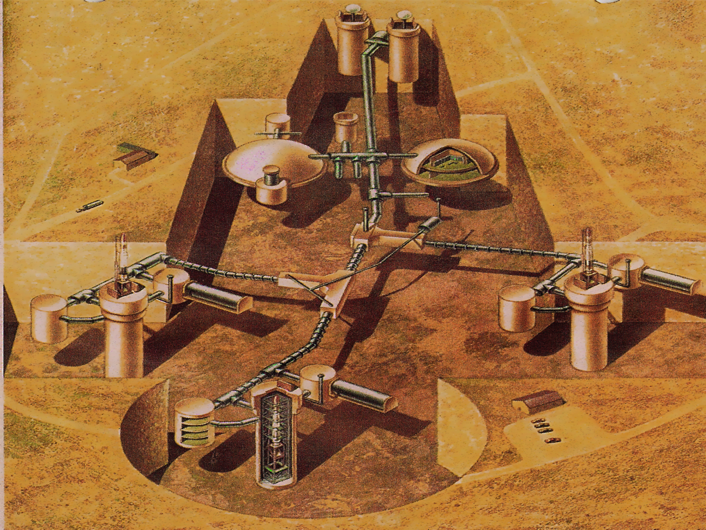 The entire internal structure was supported by giant springs so that the missile and equipment were protected from shock if a bomb should go off on the surface. I like to find all the serial number tags on the old equipment in the silo. Here, I am looking up toward the blast doors on the surface. You can see the platforms that fold out of the way when the missile would be lifted to the surface to fire. This was the only bit of color in the silo. I believe these are pressure release valves. They were probably for the fueling of the Titan missile. The staff would use an intercom system to communicate with various areas of the silo complex. I think this eye wash station and elevator are a bit redundant now that the silo has flooded. I believe this interesting looking pipe transferred the liquid fuel for the Titan missile. I’m glad we don’t have to use the stairs to get up and down in this silo. 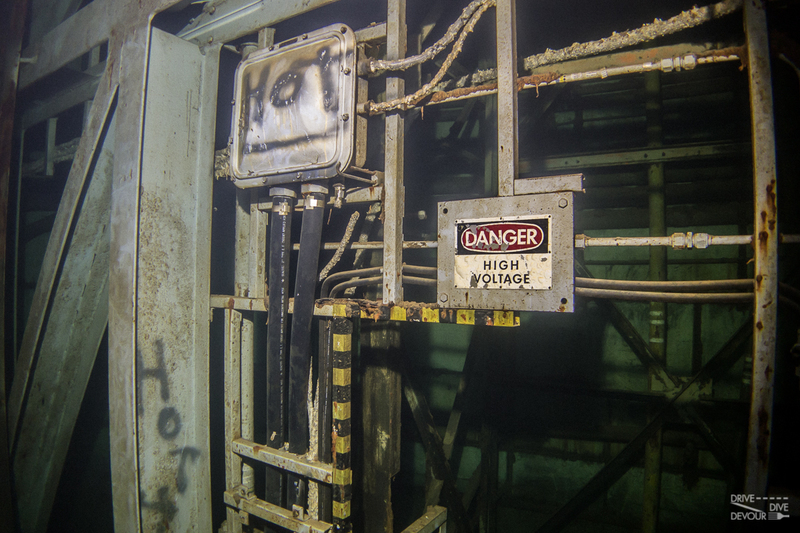 I’m sure the people working here never imagined a bunch of people swimming around for fun inside their top-secret base. 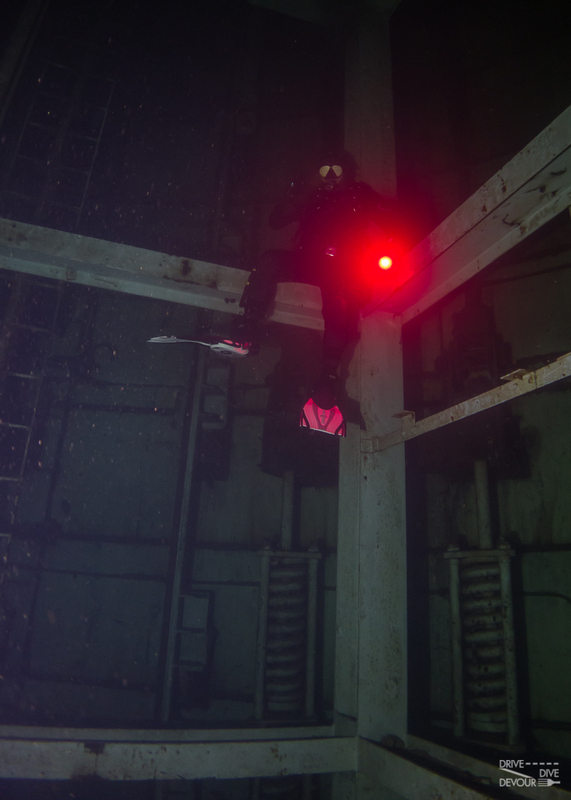 At one point in the dive, I looked up to find the dive master sitting on a beam watching everyone. It was a bit creepy and cool at the same time. 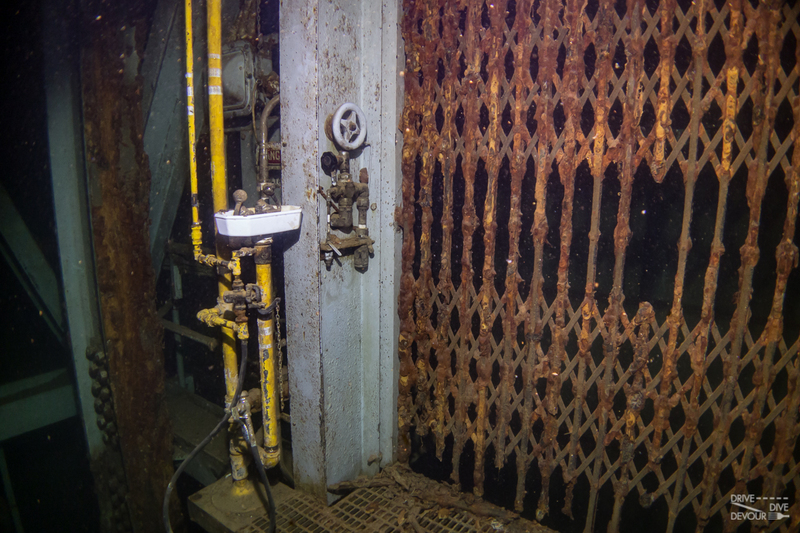 Verdict: If you are at all interested in diving and cold war era relics, this is a very cool dive! 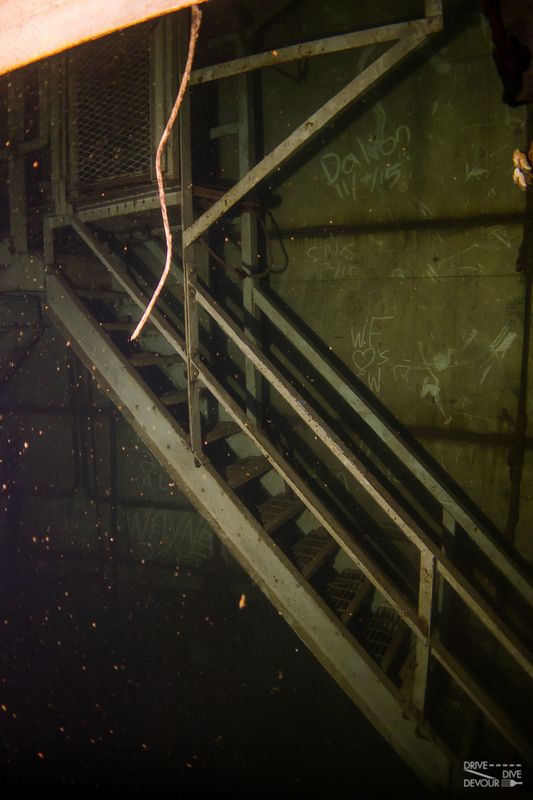 I found the walk in through the tunnels to be just as interesting as the dive itself. If you can only dive one silo, I would choose this one. It has a very authentic feel and there are a lot of little interesting things to look at along the way. If I’m in the area again, I will try to go back and explore some more. 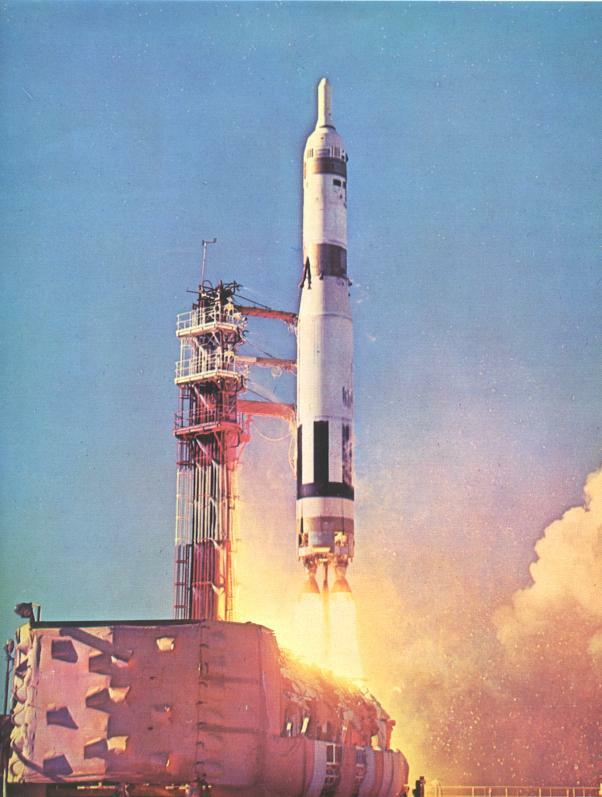 A website with the history of the Titan missile program. Wikipedia page for the 568th Strategic Missile Squadron that managed this site. 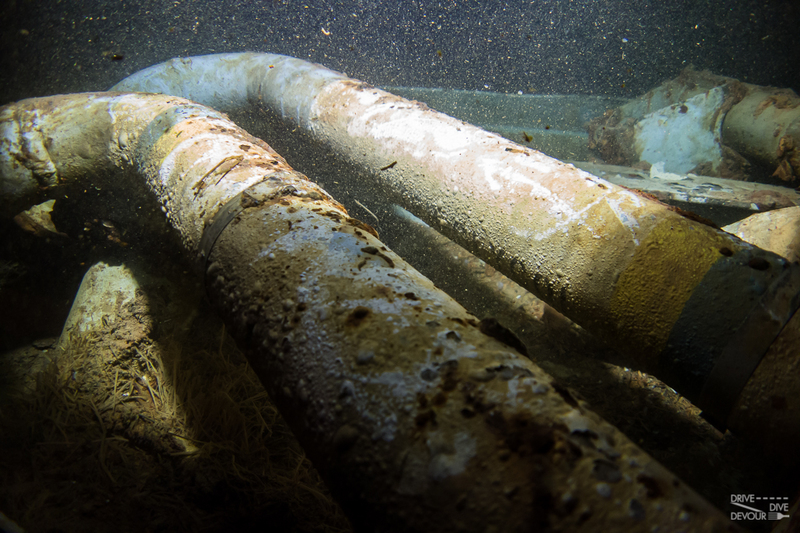 All diving at this site is managed by Undersea Adventures in Kennewick Washington. Contact them to find out when they are diving and the current requirements. I am not affiliated with them in any way. There is no nearby re-compression chamber. Dive safe. Surface temps in the summer can reach 100 degrees, but as soon as you head down the escape shaft, it cools down immensely. The water temp is in the mid-50s. 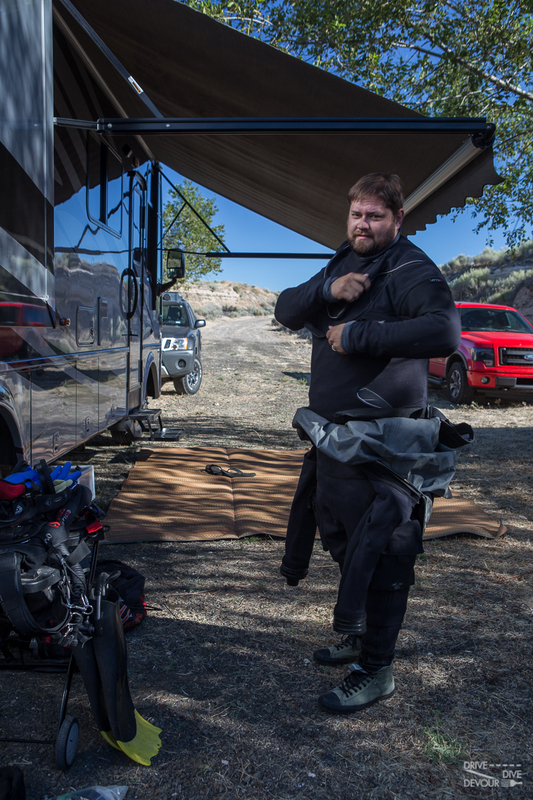 Dry suits are best, but a thick wet suit with gloves and hood can work. 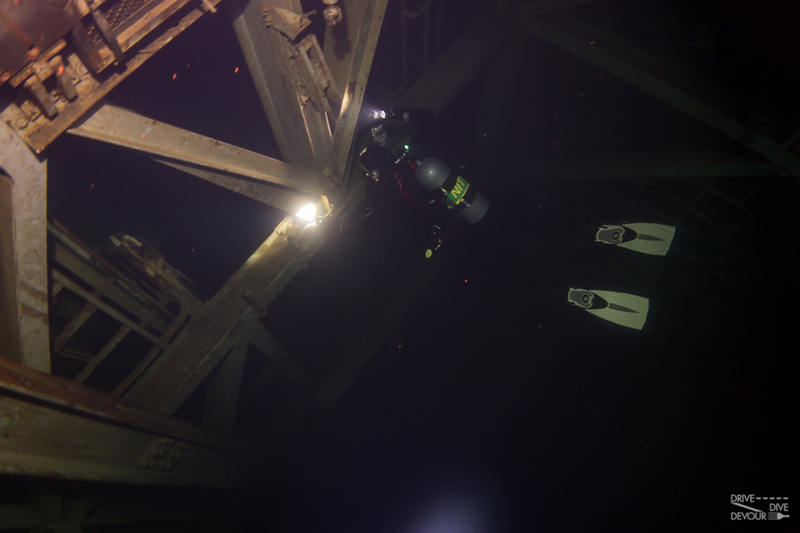 Good buoyancy control is critical in the silos. They are deep and there is silt on the beams. If you stir up the silt, it makes the visibility worse for everyone. 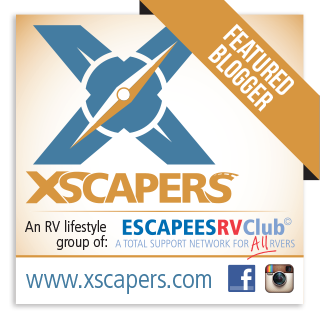 If you are traveling by RV, you can camp fairly inexpensively at the golf course in Royal City. Dive your own dive, I am not a dive professional. I do this for fun and this is a record of my trip. 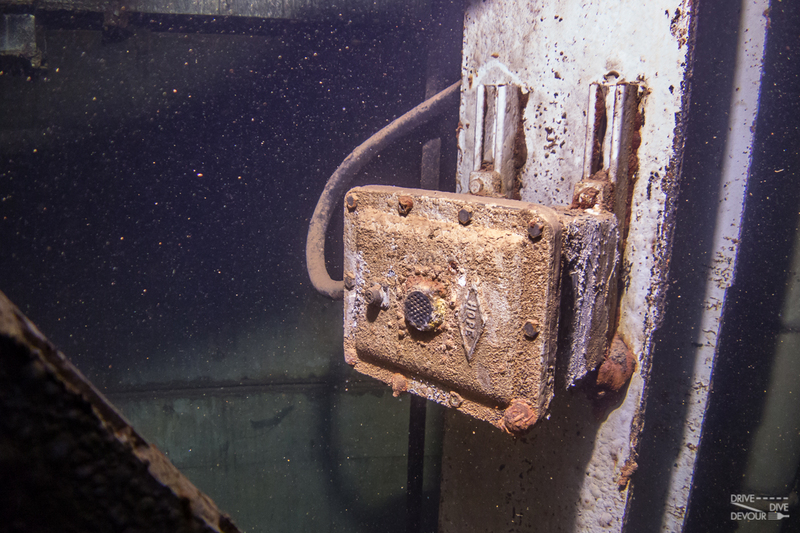 Diving can be dangerous if you are not properly trained and fail to follow proper procedures. Look for a local dive shop or dive club in your area if you want to go see some of these cool places for yourself! 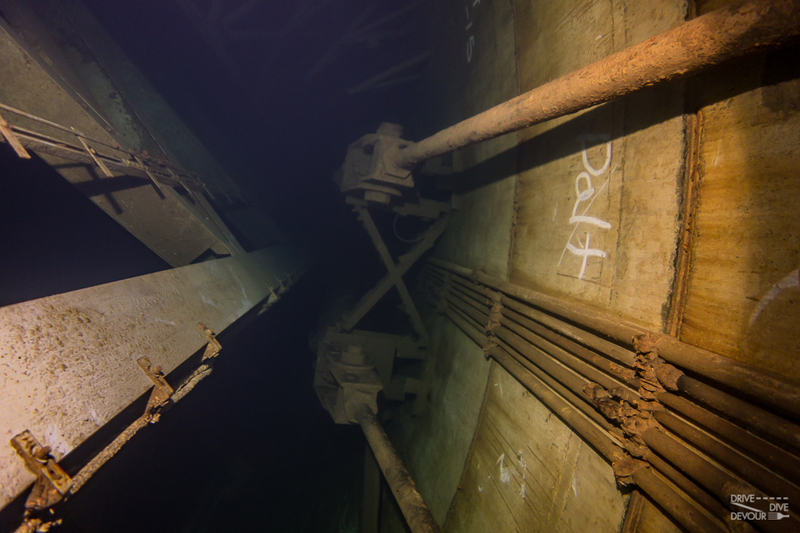 So far, I have been able to dive the 2 known dive-able missile silos in the US. Now I’m hooked and want to find more. There must be more silos out there just waiting to be explored. 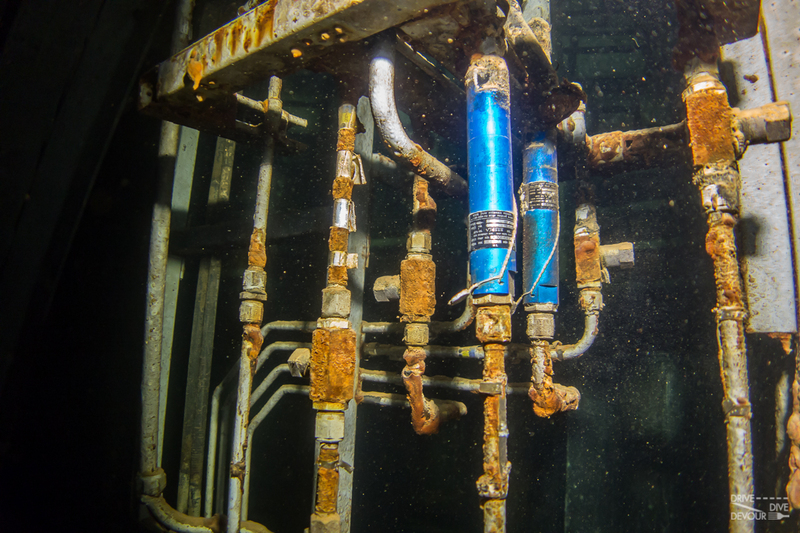 For many of the old missile silos, PCB contamination seems to be a problem. Has this particular dive site been tested before/after flooding? I’m not sure. The Atlas silo We dove in Texas was tested. Great story – and video. I also liked the quad copter vid at the end. Looks like you had to back your trailer in. Good job there too. Thanks. Yes it was a bit fun backing down there but we are getting pretty good at it. I’m glad we downsized to a 30ft motorhome. It made getting back there a little easier. Brandon, it’s not flooded, so no diving but if you find yourself in Tucson, Arizona drive 14 miles south on I-19 and visit the Titan Missile Museum. It is the only Titan II site left and would be an interesting contrast for you after being in a Titan I site. They give tours on the hour and it is pretty interesting. Thanks. I’ll check it out when we get back out that way. It would be cool to compare. Although I haven’t visited a Titan missile silo, I was fortunate enough to work for Martin Marietta on Pad 19, the Titan II pad at Cape Canaveral, the summer of 1961 as a student intern while attending MIT. It was a memorable experience. Nothing like having to climb the umbilical tower on the first day on the job! Awesome!! It was great diving with you guys. Let me know when you are in AZ. I have some really unique dive spots that need to be explored. Great video! Great article! We’ll definitely have to come check them out sometime! Obsessed with your diving blogs, I’ve always wanted to start diving, and your blogs may be the catalyst to finally try it out! 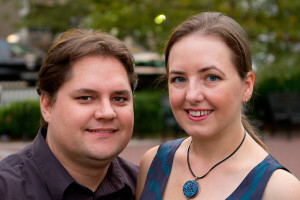 Great blog and thanks for the awesome pictures. This Titan missile silo complex is much larger than the Atlas silo that I dove previously. It also had much more of the original equipment inside. 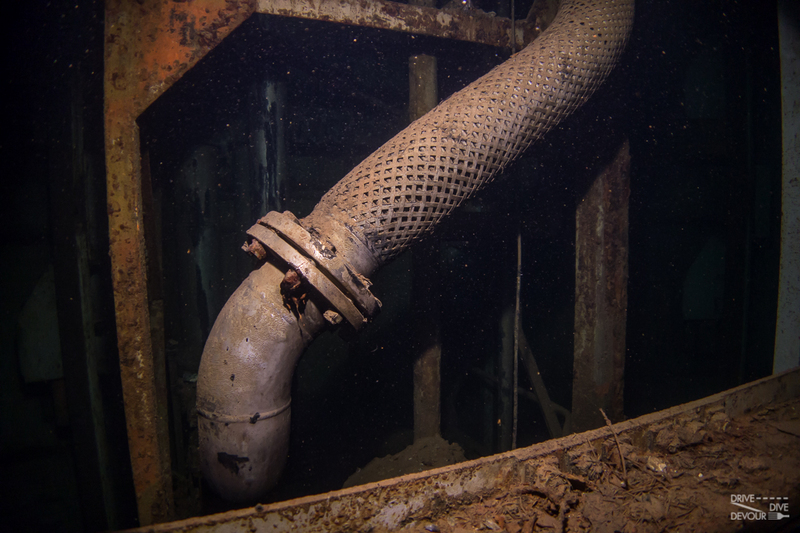 I only did 2 dives here, but I could easily do more to explore other areas in the complex. Would it be worth trying to schedule a second day of diving there? I think you will be fine with just 1 day of diving, but it is a bitnof a difficult site to get to so maybe you want to do 2 days. Wow from Germany! I m impressed! One reason more to visit USA. So one day I have a long list to do. 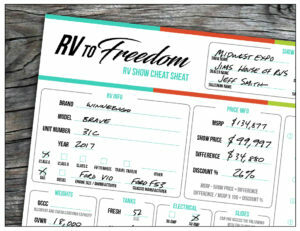 SIGN UP FOR UPDATES AND GET THE RV SHOW CHEAT SHEET FREE! Do you want every blog post in your inbox? Yes, I want every new post! Drive- We switched our stationary life to travel the US in a motorhome and explore all its unique regions and cities. We’ll give you the low down on our favorite finds, so you can experience each locale with us or when you visit yourself! Dive- You can scuba dive anywhere if you try hard enough! 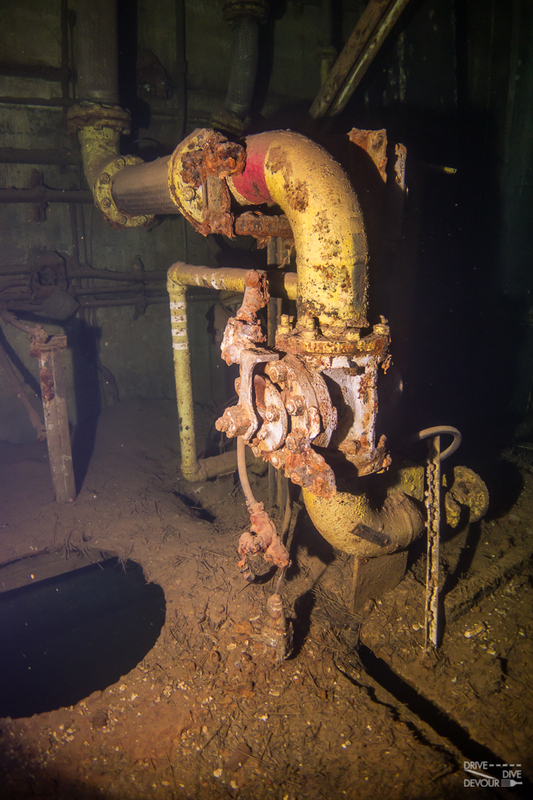 The Keys were a fantastic diving spot, but the Texas missile silo was pretty cool, too. Brandon’s out to prove the US is a dive destination. Devour- We love to find local foods and experience regional dishes when we travel whether it’s at a restaurant, in a shop, or at the farmer’s market. We’ll dive into regional cuisine tasting what is on offer and then recreating some of the dishes at home- often with a vegetarian twist.